South African President Jacob Zuma adresses Marikana miners as he visits the Nkaneng Informal Settlement on August 22 in Rustenburg, South Africa. 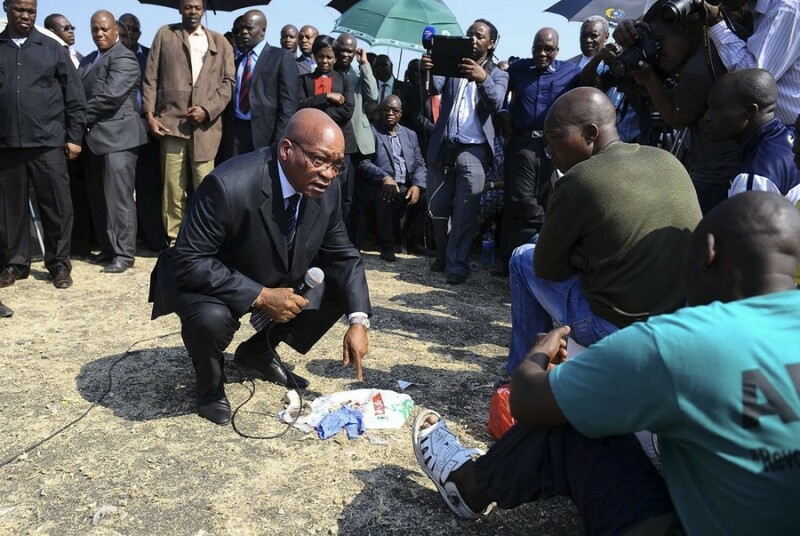 The President visited Marikana in Rustenburg to address workers at platinum company Lonmin, following the the Marikana tragedy in which 34 striking miners were shot dead and another 78 were wounded by police last week. 10 people were also killed in the week before Thursday's shootings, including two police officers and two mine security guards. Zuma was joined by the inter-ministerial committee investigating the violence. South African President Jacob Zuma speaks to the leadership of striking Lonmin mineworkers during his visit to Marikana near Rustenburg, South Africa, Aug. 22. President Jacob Zuma announced an inquiry into the violence at the Lonmin mine and declared a week of national mourning. South African police confirmed 34 people were killed and 78 injured during the strike by mine workers from Lonmin Marikana mine on Aug. 16, causing a huge public outcry. 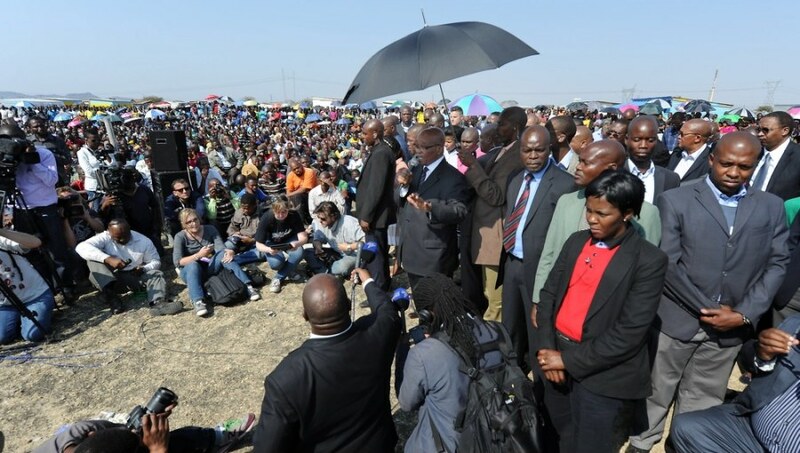 Reuters reports: At Marikana, a somber-looking President Jacob Zuma stood under a parasol held by an aide to address around 2,000 subdued miners. In the Xhosa and Zulu languages, he said there was no need for workers to die in a Labor dispute. "I have taken a decision to set up a commission to investigate this so that we can get to the truth," Zuma said. Memorial services will be held for the 34 South African platinum miners gunned down by police last week. The country's embattled President Jacob Zuma visited the mine, promising a full judicial enquiry while reassuring international investors that South Africa was open for business. But the price of platinum on world markets surged - as reports suggested strikes were spreading to other mines. Inigo Gilmore, Channel 4 Europe reports.